Wyoming is huge and sparsely populated. Its people make me flashback to Gary Cooper Westerns that portray ‘Coop’ as silent to the point of frightening. Point—during my teaching years I remember one mid-October day when I received a new 8th grade student who hailed from Wyoming. He enrolled rather late during the school year. I wanted to find out more about this silent student. That particular week I had outside playground duty; he and I spoke. The kid wasn’t one for many words. He told me the reason why his family moved to Chicago. They were literally ran out of town Wild West style sans rail, hot tar and rope for doing something I didn’t ask nor needed to know. If this kid was a reflection of typical Wyoming mannerisms I’m glad I watched my step when in that state. I read later that they still round up cattle, hunt rustlers, openly carry side arms though I haven’t read about anybody being a recipient of any ‘necktie parties’ lately. 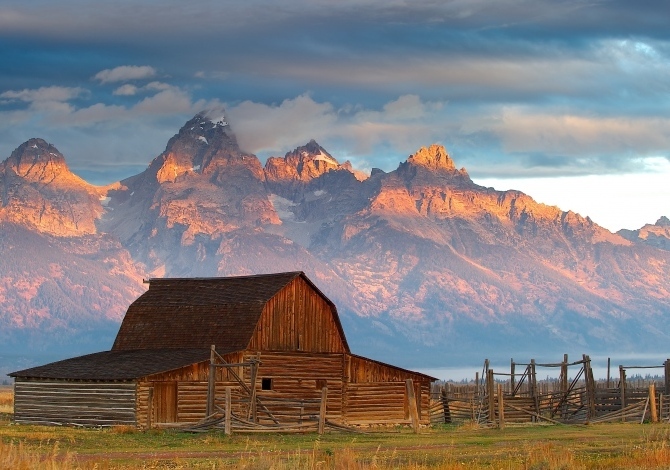 Wyoming in all its vastness is still a child of the Wild West where rodeos, horse auctions and where western clothes are still worn on special occasions. I’m an artist. I draw portraits and cityscapes. In the few art galleries I’ve visited during my brief stay in ‘Frontier City’ the local galleries were a vast array of all things Western. Search: ‘Wyoming cowboy art’ where you’ll see a wide variety of images and links to ‘cowboy/girl’ clothes, saddles and other equestrian accessories. *One warning: never purchase western duds out west; too expensive. Shop either online or ‘out East’ in cities like New York, here in Chicago, the Twin Cities and other metropolitan areas. It was my first bus trip out West. I’ve always wanted to see the majestic Rocky Mountains close up. Now I would traverse through them, sitting on that Greyhound bus looking out the window. We wound our way up the steady incline I saw the approaching Rockies from a distance on the horizon. In all honestly I was a bit disappointed. There was barely any snow on their summits and they looked small; mountains enough though more like very high hills. One could see miles of sparsely ‘developed’ sections of this large state. The state appeared to have been devoid of the familiar ‘concrete canyons’ that engulf mid-western shopping malls that dupe customers into purchasing junk. Wyoming is still a virgin land barely touched by the heavy hand of human interference. About a few hours into our trip the driver stopped at a local KFC. Placing my chicken order was a weird experience. The slow moving, taciturn girls behind the counter and some seated patrons looked at me weird as though I was from another world which in their eyes I was. It's truly amazing that compared to other nations each American state is totally different from its neighbors, yet we remain a single country. ‘E Pluribus Unum’ ‘From Many One’ isn’t mere words to many Americans. People watching are one of the feature attractions Greyhound busses offer. On board were four Italian girls who were on holiday from school and wanted to see the United States. In the back young couples were taking turns going in and out of the lone restroom. There was a woman and her three children playing quietly as their mother made out with some strange man she met en route to her destination some tiny town near the foot hills of the Rockies; then there was the college professor from a Canadian war college. Unlike the more taciturn ‘Whyomingites’ this guy was a stimulating conversationalist. From his mustache and goatee I initially took him for a poet, writer or another person who earned his living with his pen writing about people who earn theirs by the sword. Teaching about military strategy and tactics was the furthest profession I associated this wimpy looking guy with. We had a few hours layover in the state capitol. 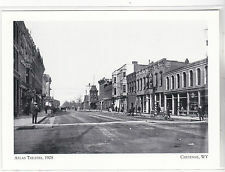 Cheyenne was nicknamed ‘Frontier City’ during the time of the city’s founding. 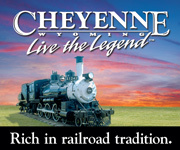 Cheyenne was popularized by the hit AMC television sitcom ‘Hell on Wheels.’ The show is about the building of the Union Pacific and Central Pacific Railroads up to their engines joining up at Promontory Summit (Point), Utah. Americans on the whole aren’t history buffs; we get a lot of what happened back then through the medium of television. Perhaps not entirely accurate ‘Hell on Wheels’ was well researched so through that viewers are visibly and mentally transported to that time in United States history known as the ‘Reconstruction’ that brief period after the American Civil War when the evils of racism and sexism narrowly missed becoming ancient relics of an evil time. This show puts viewers in the midst of the raw violence and hardship of ordinary life in the latter part of the 1860’s and 1870’s. The racial and sexual violence of that era replete with racial/sexist prejudices of that period is portrayed no holds barred. It was a wild period where might was right. This long running program isn’t for the politically correct which surprises me that it ran so long given the wimpish national character of these modern United States. Image: Jackson Hole - Atlas Project Despite its utterly turbulent beginnings contemporary Cheyenne’s populace are among the most literate anywhere. According to my research 23% of its people hold Bachelors and Masters degrees with a substantial number of post graduate degree holders thrown in. World class colleges and universities abound in Cheyenne and in smaller communities throughout the state. Wyoming gave women the vote in 1869 a full 52 years before universal suffrage. The assent through the Rockies was slow and steady; the incline a bit steep though I experienced none of the customary altitude sickness I felt on top Grouse Mountain in Vancouver, British Columbia. The only time I knew we crossed the Continental Divide was from a small sign on the side of the road. The decent wasn’t much to write about. The weather was still on our side nary a cloud in the sky. The bus drove through a number of small towns, hamlets, cattle ranches, gasoline stations, country graveyards, road side gift shops, a church or three, over railroad tracks and near whatever hills that lined the U.S. Interstate 80. When I was a kid I was an avid rock hound a passionate collector of rocks and minerals. I had a number of books on the subject. If I were ever going to become a scientist Geology was going to be my field. The state of Wyoming is rock hound heaven! There are a large number of mineral and gem societies scattered throughout the state. I remember when I was a kid back in the bad old days my Mom used to accompany me to the then free admission Field Museum of Natural History here in Chicago. Though Mom wasn’t a fan she used to help me pick out small affordable bits of minerals, rocks and semi-precious gems they sold to tourists in those days. Mom’s gone now. Thanks to better times I can now afford the large and expensive pieces of those precious stones I used to pass by behind glass display cases and only look at. The high point of my collecting days was when I took one of several trips to South America. During one of my adventures I climbed a small mountain. While walking along a jungle trail partially hidden by dense underbrush I accidentally stumbled over large chunks of mineral deposits that somehow broken off the side of this mountain. Crystals, semi and precious stones of every description lay on the ground embedded in chunks of rock ripe for any passerby to cart away. Since this trail was off the beaten path I was the first one to have spotted it. My then brother-in-law helped fill my knapsack with as many specimens we could carry. Overloaded we eased ourselves off this side trail back on to the main trail and eventually found our way out. I still have them; the name of the country and mountain; my secret. To find your own fortune and glory log into: ‘Wyoming State Mineral and Gem Society at: www.wymineralandgemsociety.org. Their offices are in Cody, WY. Another warning: the vast expanse of Wyoming is for the physically fit not the physically fat. The state known as ‘The Equal Rights’ and or ‘The Cowboy State’ is still a wilderness; if you plan to stay there for any appreciably amount of time make sure you’re in good physical health. According to ‘Kiplinger’ writer Sandra Block’s article ‘10 best states for taxes on retirees’ Wyoming is second only to Alaska. I personally think the reason why the Equality State is so high up on the list is because aforementioned there’s so few inhabitants living there the state government use tax breaks as incentives to entice people to relocate there. The big drawback; Wyoming is so damn cold in winters not ideal weather conditions for seniors like myself who are prone to falls due to icy conditions. Cold weather tends to accentuate arthritis and a number of age related infirmities. On the positive side Wyoming has no state income tax and very low property taxes. Another reason why living in Wyoming is relatively cheap is the state collects high revenues on abundant mineral and oil rights. According to the Tax Foundation Wyoming residents has one of the lowest tax burdens in the U.S.
Wyoming’s sales tax is only 4%; there’s no estate or inheritance taxes. Point—if you were to relocate and purchase a home for around $200,000.000; your property tax would be about $2,000.00 max the 8th lowest in the country. For seniors it gets better; if seniors meet income requirements (borderline poverty?) they are eligible for a refund of around $900.00 but $800.00 for single seniors on property, utility, sales/use taxes. State gasoline tax is .24 per gallon; you save a nickel per gallon in respect to the rest of the country; a paltry sum but something is better than nothing. In case you’re interested Wyoming has the lowest beer tax in America! Wyoming needs live bodies in a very big way. Would I relocate to the Equality State; nope; wouldn’t know how to act with all that peace and quiet. As we were preparing to exit Wyoming we paused in the small city of Evanston. Not much to say about the place as our time was short. Outside of being a major rail road center Evanston has some fine museums, three star hotels an active chamber of commerce and other interesting sites. The city is spread out. Walking is a must. See map for best places to go. After my fellow passengers and I served nature’s needs we boarded the bus and continued our trek. Some hours later we crossed the Utah border. Seeing the Great Salt Lake for the first time was awe inspiring but that’s another story. If you plan to travel to Wyoming I strongly suggest that you do so in summer; however if you’re a cold weather person, enjoy winter sports and with the Christmas and New Years holiday season rapidly approaching perhaps Jackson Hole, a very popular skiing resort with its own international airport is your thing. Here’s a site that opens to a myriad of other Wyoming resource sites; log in to: ‘Wyoming tourist’ There are large numbers of sites on this page about the Equality State. Enjoy Wyoming! Canada is a plumb of a country; it’s pretty. Victoria in Vancouver Island is like a fairytale.